Last week, our G.O.D. East Africa Leadership Cabinet (Cameron Kagay, John Nyago and Grace Aaseby) traveled to East Africa to invest into our team on the ground in Uganda. The team assessed particular projects, taught seminars, clarified employment standards, and spent a lot of time in worship and the Word. Here, Grace Aaseby reflects on her experience. Grace (left) with our female cooperatives in Uganda: Josephine Nakimuli, Cissy Namukisa, and Annette Nabugo, harvesting lemongrass on our East Africa campus. While I was walking back from harvesting sukuma wiki (a type of collard green) with my friend Annette, we were talking about herbs Ugandans make teas with. She brought me to a tall long grass that smelled like lemons, which she told me they use for teas to treat stomach illnesses. I excitedly began telling her what I knew of the benefits of what I knew to be lemongrass, including the antimicrobial compounds that make it useful for cleaning around the house. Annette’s eyes lit up. “That must be why my mother would use it to scrub our dishes and wash our home with it when I was a child!” Often, the resource that can help us most is already within in our reach. According to Nyago John, originally from Uganda, empowering education in health care is very rare in East Africa. Often, mission groups attempt to help the problem, but not prevent it. Through seminars like this one, we’ve seen our cooperative families forego sickness for years at a time, which is unheard of in their villages. At the end of September, I had the privilege of visiting our co-laborers in Uganda in with my fellow East Africa team leaders, Cameron Kagay, and John Nyago. As a mother of 5, my opportunities to travel abroad are rare. But the Lord granted me this opportunity, and I was happy to serve. During the trip, my “mom-senses” and education in the Word and health were on high alert. I was able to share on some important topics, like how our immune system is strengthened and weakened through daily choices we make in nutrition and care of the home. Our discussions were quite dynamic, as we discussed “new products” that replaced the “old.” For instance, cleaning sprays wrought with harmful chemicals are marketed as “the best” because they are from the West, forsaking the lemongrass wash that was once commonplace. Our community there was encouraged to think constructively about what resources they have already at hand, and how they might be all they need. We concluded the health seminars with a workshop teaching them how to make disinfectant cleaners for their homes, with lemongrass as our chief ingredient. 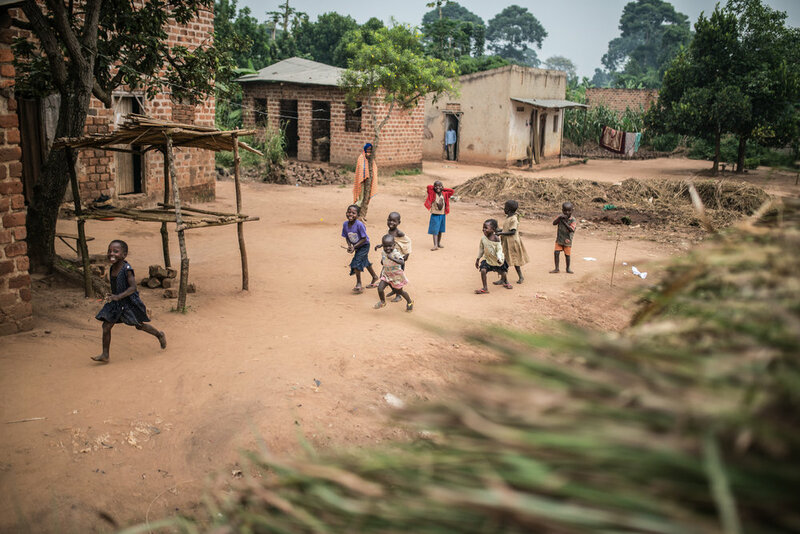 A scene from the village where our hub is located in Uganda. As a mother, I often run into a lack of resources. I have the choice to either be resourceful, using what I do have to get the job done or assume the job can’t be accomplished without some special resource that I don’t have. But we all have this same choice in any kind of resource-deficient scenario. We choose to find a way, or we choose to give up. Looking around the village where our hub is located, it’s obvious that a lot of people have chosen to give up. And in my hard moments, I would be right there with them. As I see kids without proper shoes or clothes, without healthy food to eat, parents without jobs, and an education system that is far from thriving, it’s quite easy for me to give up. I don’t have enough to meet this need. Maybe someone else, with more money, or more power, could do something here, but not me, I’m just a mom. While we were there, Cameron Kagay, my good friend, gave a sermon from Luke 9, where Jesus’ disciples request to send the crowds away, because of they lack the necessary resources to meet their needs. The crowd was hungry, and they determined the best course of action would be to send them away to find food and lodging for themselves. But Jesus responds to them: “You give them something to eat”. The disciples, like many of us, were caught up on the fact that their resources were too limited to meet the need in front of them. It feels justified: there are so many hungry, and it’s getting dark. But Jesus charges them to feed them anyway, knowing that they had everything they needed within reach. I was deeply moved by this message. Jesus was developing his disciples to meet the great need that surrounded them. He charged them to meet it, forcing them to realize they had more than they thought. Through Grace’s health care seminar, the women harvested lemongrass and included it in bottles with water and vinegar to serve as a natural cleaning spray in place of the ones sold in their stores, wrought with harmful chemicals. This message spoke to me: I was reminded of what resource I have, to share with them. Being a mom is not my weakness, it’s a strength if I let God use it. But I also saw our female cooperatives choosing to have faith in the same way, meeting needs that most would say are “too big” for them. They are truly our co-laborers in our work in East Africa, and they have chosen to have faith enough to “feed” their village with resources that already are at hand. Without lunch served, many students return home from school after the day break, unable to concentrate much longer. With lunch served, this group of young students is able to stay and practice their reading as they are supposed to! Josephine is one of the lead teachers at St. John’s primary. She checks all of the other teachers’ lesson plans for quality. She continues to invest energy into understanding health care so that she can bandage wounds, assess symptoms, and care for the many children who are sick while they are at school. Cissy is the face of The Trade, offering customer service and satisfaction that exceeds every other store in the village. At one point I needed some water and they opened the shop just for me, but nearly 30 people followed me there and they had to keep the shop open for an hour to fulfill everyone’s needs! Annette just had a precious baby, but it didn’t stop her from taking detailed notes at my discussion, getting ready to re-access and implement God-given solutions for the health of her home and teach others to do the same. Each of these women volunteer for the weekly distribution of food for 400 students at St. John’s, choosing to feed an overwhelming crowd of hungry students. Others have been so inspired by their service that they’re contributing their resources to help the program. Recently, one man volunteered to build a shelter so that rain won’t stop these feedings from happening. God has given us enough, and it’s within our reach. Jesus’ instruction to the disciples reminds us all when we’re looking at situations of incredible need, to say: “I might not have much, but it’s enough to help in the way God calls me to.” God gives us all enough, and it’s within our reach, no matter where we’re from. We just have to have the right eyes to see it. On my recent trip to Uganda, I witnessed people choosing to see situations of need with the right eyes, obeying Jesus’ call to “feed them,” regardless of the resource lack they might feel. When God’s presence is with you, what you need is always within reach.